17 150 Merc 23 Tempest, 6" Atlas hydraulic, HB Helix, MK Fortrex. 96 175 Merc 24 Trophy, manual jackplate, HDS9, HDS7, MK Edge. 01 200 Merc EFI 26 Trophy, 6" T-H Marine jackplate, MinnKota TM. 05 150 Merc Humminbird 596HD DI, MinnKota Maxxum 65#. 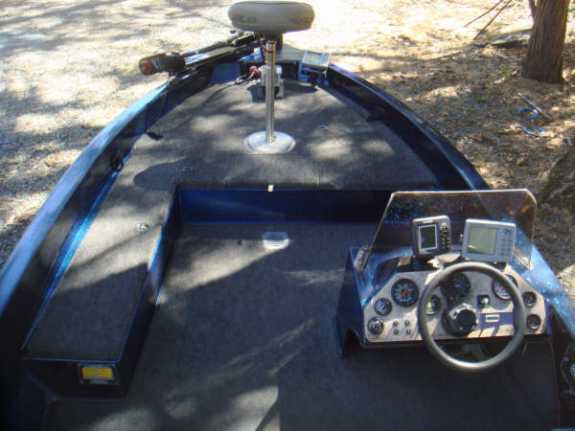 12 225 Merc Opti 25 Tempest, 6" Bob's hydraulic, Lowrance HDS10, HDS7, MinnKota Maxxum 74#. Propshaft is 3 1/4" below the pad. 05 225 Merc Opti 26 Tempest, 6" Bob's hydraulic, Lowrance HDS8. 93 150 Merc 25 SS prop, Humminbird 560, 160, Motorguide Classic. 98 225 Mariner Lowrance/Humminbird electronics, Motorguide TM. 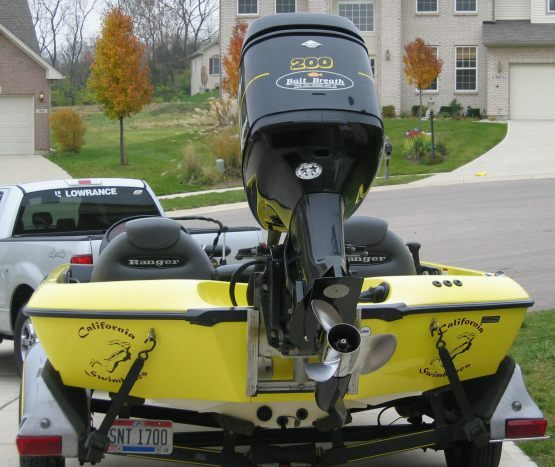 90 150 Yamaha Humminbird 798ci SI, Garmin 240, Motorguide 24V. 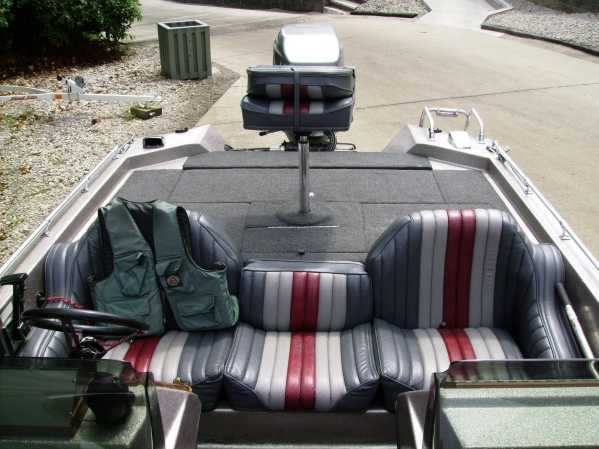 11 150 Merc 23 Tempest, Humminbird 728, MinnKota Maxxum 80#. Propshaft is 4" below the pad. 57 mph @ 5250 rpm (gps). "Adding a 6-8" jackplate to see if I can increase mph/rpm. 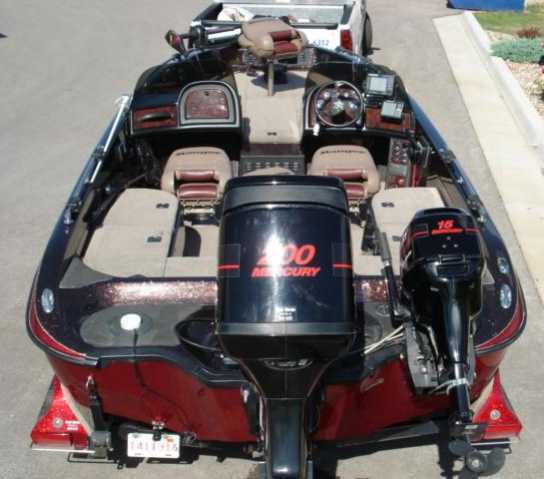 99 200 Merc 23 Tempest Plus, Humminbird 997, 798, Motorguide 782. 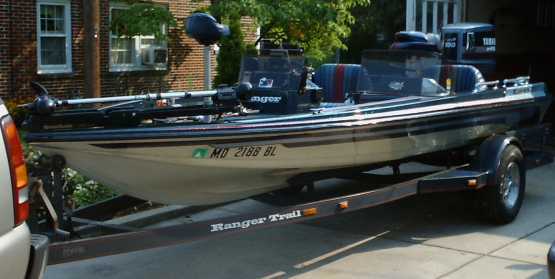 09 150 Merc 21 Trophy, Lowrance X35, X96, Motorguide 71# TM. 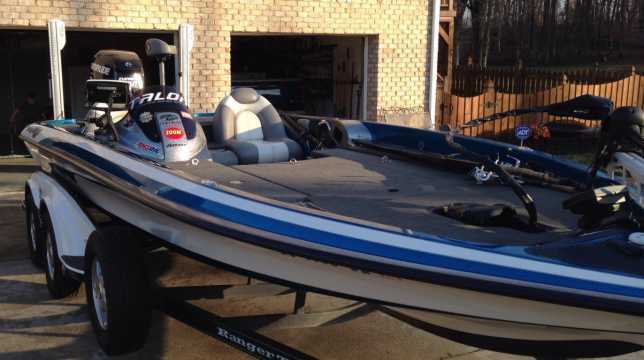 10 250XS Merc 25 Tempest, 10" Atlast hydraulic, Lowrance HDS10, HDS5, MinnKota Fortrex 101#. 69.8 mph @ 5850 rpm (gps). 04 200 Merc 25 SS prop, 10" RiteHite jackplate, MinnKota 101#. Fast Strike 24 Raker, Humminbird 787C's (2), Motorguide 72# TM. Propshaft is 4" below pad. 57 mph @ 5600 rpm (gps). 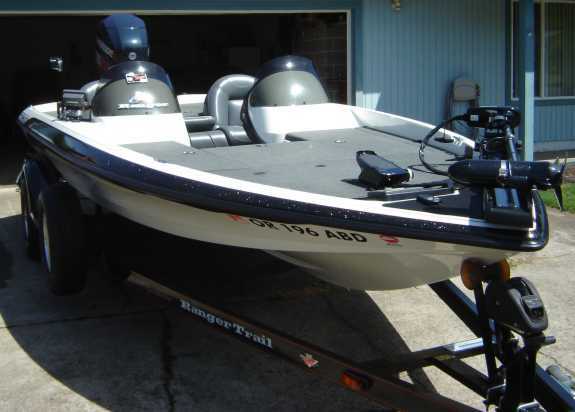 95 150 Suzuki 26 Renegade, manual jackplate, MinnKota Maxxum TM, Lowrance HDS7's (2). 04 225 Evinrude Lowrance LCX37, HDS5, MinnKota Fortrex 101# TM. 03 125 Merc 3 blade SS prop, Garmin electronics, MinnKota Maxxum 55#. 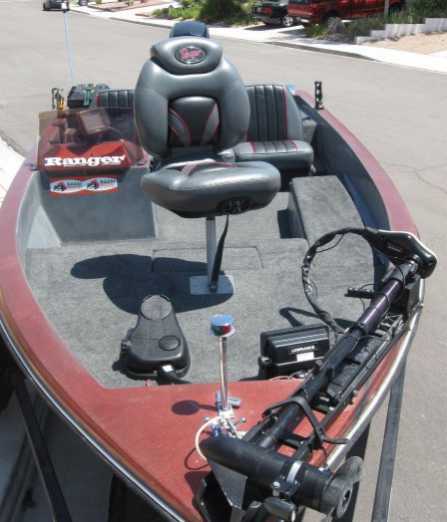 11 200 Merc ProXS 25 Tempest, 8" Atlas hydraulic jackplate, Lowrance X135's, MinnKota Maxxum 80#. 70.1 mph @ 5740 rpm (gps). 99 115 Evinrude Ficht 21 Viper prop, Eagle Fish Easy 320, MinnKota 65# TM. 54 mph @ 5300 rpm (gps). "I've always loved these little 320's. 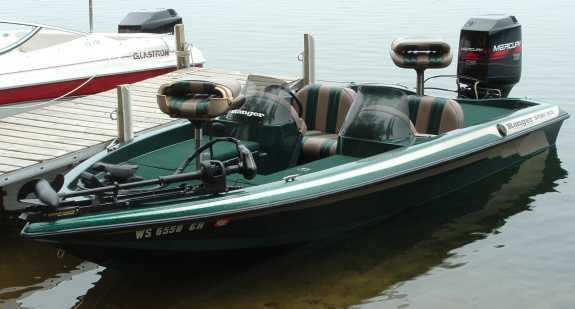 Ever since I first saw one some 25 years ago, I always thought they were the best "little" bass boat ever made. I came across this little gem a little while ago and I just had to buy it! 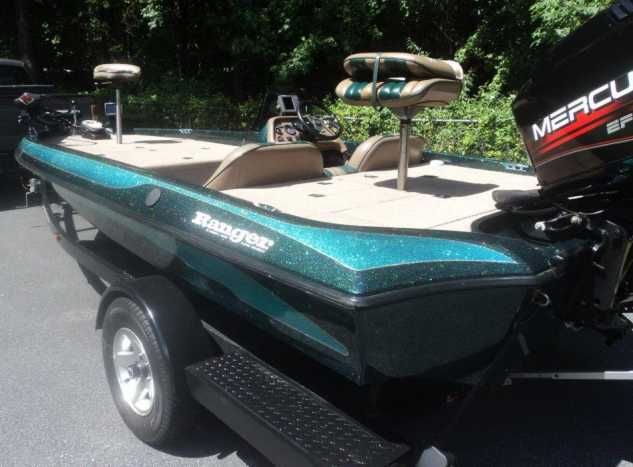 97 225 Merc 23 Mirage, Lowrance 510C, 67C, Motorguide TM. 95 150 Mariner 23 PowerTech, Humminbird 787c2, Motorguide TM. 06 200 Merc Opti 25" Tempest, Lowrance 520C's (2), MinnKota Fortrex. 06 175 Merc MinnKota Max 80#. Two 8' Power Poles. 66.7 mph @ 5600 rpm (gps). 89 200 Mariner 60 mph (gps). 99 200 Merc MinnKota Maxxum Pro 101#. Propshaft is 3.25" below pad. 04 225 Evinrude HO 72 mph (gps). 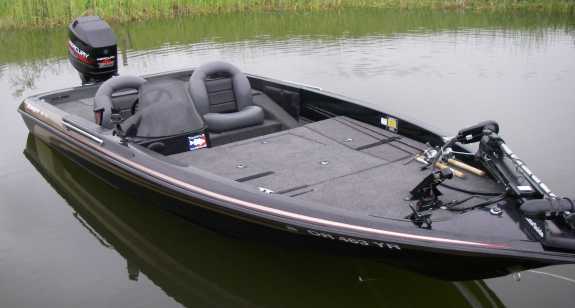 09 225 Yamaha MinnKota TM. 00 200 Merc MinnKota Fortrex 80#. 68 mph (gps). "Great fishing boat. Fits everything I need and want. Can't beat a Ranger." 99 175 Evinrude LCX27C, MinnKota 80#. Motor is 6" above the transom. 68 mph @ 5900 rpm (gps). 94 150 Johnson MinnKota Max Pro 101#. Propshaft is 3.5" below the pad. showroom and performs even better." TRP rpm (gps). "Yamaha has dual props." 02 200 Merc Propshaft is 3.5" below the pad. 68 mph @ 5800 rpm (gps). 06 225 Merc MinnKota Maxxum Pro 80# US. Propshaft is 4" below pad. Optimax 68 mph @ 5600 rpm (gps). 07 225 HO Evinrude MinnKota Fortrex 101#. Propshaft is 2.5" below the pad. 68-70 mph @ 5850 rpm (gps). 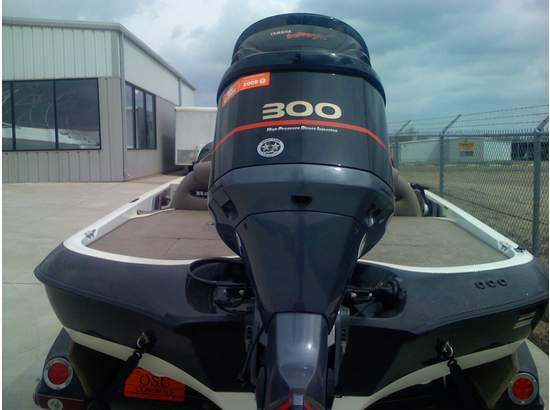 90 XP150 Evinrude 60 mph @ 5500 rpm (gps). 94 200 Mariner 109# Tour. Propshaft is 3" below the pad. 01 225 Merc Opti 74# TM. 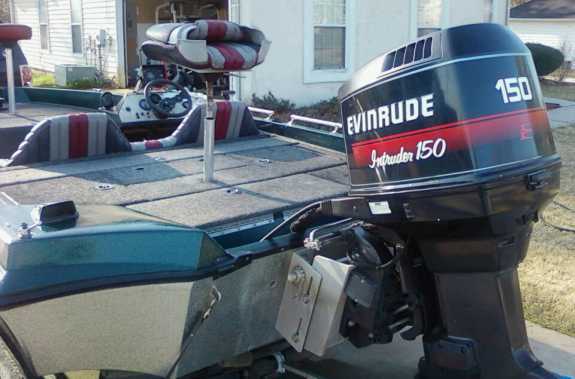 00 225 Evinrude 68 mph @ 6000 rpm (gps). 90 150 Merc XR4 MinnKota Power Drive. 66 mph @ 5600 rpm (gps). 98 225 Merc EFI Lowrance X135, Motorguide 36V 109#. Propshaft is 3.0"
below the pad. 71 mph @ 5900 rpm (gps). 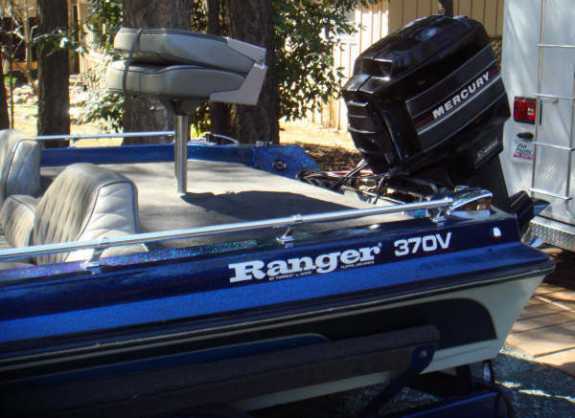 Ranger, got battery charger replaced for free from a recall. that looks and works like new!!" 91 100 Mariner Motorguide Tour 82#. 60 mph @ 6000 rpm (gps). 00 200 Merc 65 mph (gps). 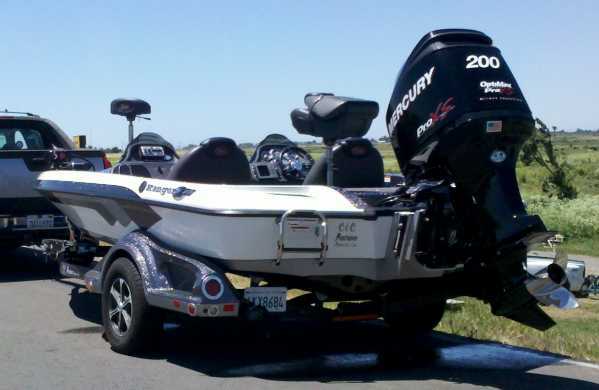 Pro XS fishing machine, very comfortable at top speeds." gps. This Ranger is a keeper." 05 250 Yamaha HDS8, Motorguide Digital 36V. 72 mph @ 5800 rpm (gps). 90 150 Yamaha Digital Tour 82#. Propshaft is 4" below the pad. 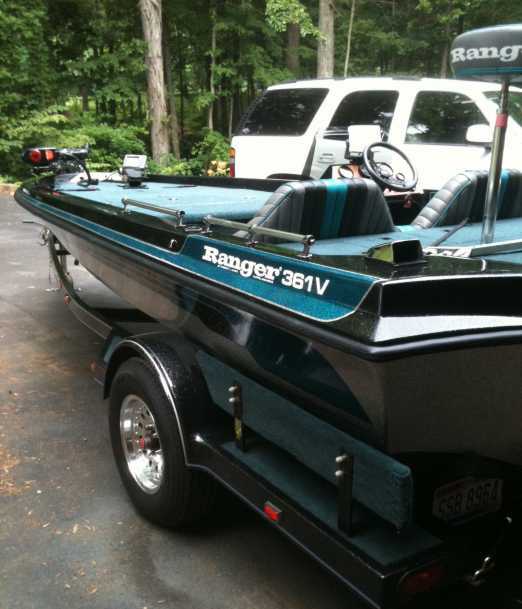 first Ranger with only 109 original hours on this beauty. with Raspberry trim, all original. Very nice boat and I love it. Gonna enjoy it a long time." 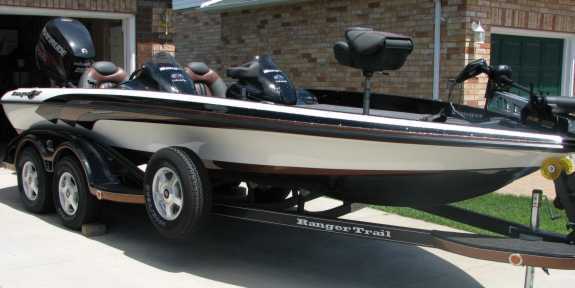 the boat but Ranger has been good about correcting them. side console last month too!" 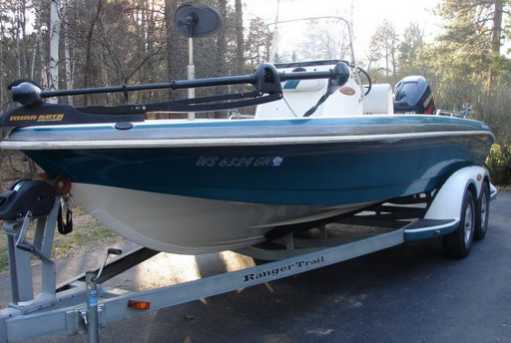 09 250 Yamaha MinnKota 101# TM. 09 200 Merc FishElite 80, Motorguide Tour Edition 82#. Propshaft is 2.5"
and fast for a barge." 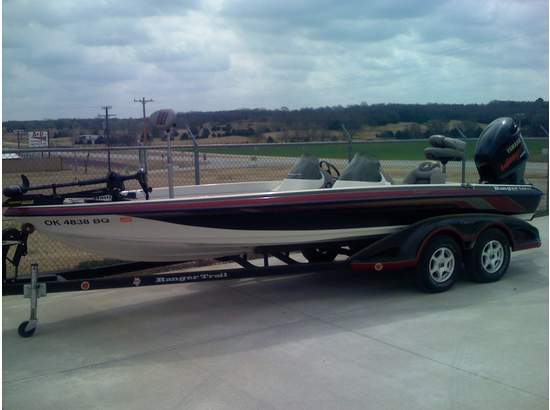 looking to get new prop to fix rpms and top speed." 08 150 Merc Opti 58 mph @ 5400 rpm (gps). 93 150 Johnson progress of updating TM and electronics." 5300 rpm (gps). "Looking for the right prop." 96 115 Johnson MinnKota Maxxum 74#. 49 mph @ 6500 rpm (gps). "This is a great starter boat and it's great on gas." 86 175 Merc Motorguide Digital Tour Edition. 06 175 Merc "I would like some info from guys who have a similar setup. 90 GT150 Johnson Dimension 3 Scan 120, Motorguide Brute. Updated 10/12/09....... 70.2 mph @ 5600 rpm (gps). 07 200 Merc Opti the pad." 22 under the bench seat." 06 225 Yamaha 72.7 mph @ 5600 rpm (gps). 06 225 Evinrude MinnKota 101#. Propshaft is 2.5" below the pad. 68.5 mph (gps). 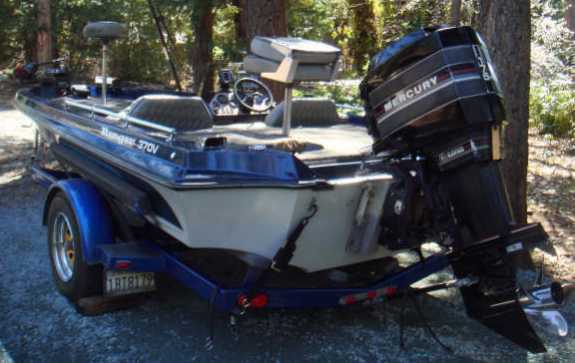 "Boat is new to me, still working on set-up." yet doesn't want to pay $60,000. for a bigger model." 520 or 521 next year so if you are selling let me know." 08 250 Merc Opti X135, MinnKota Maxxum Pro 101#. "Working on my setup." 09 175 Merc MinnKota TM. 64 mph (speedo). 3 and 5" below pad. 73 mph (gps). 07 150 Yamaha MinnKota Maxxum Pro. Propshaft is 2.5" below the pad. height. Good holeshot but would love to break 60 mph." 07 225 Yamaha 68.7 mph @ 5700 rpm (gps). 08 250 Evinrude ETec MinnKota Fortrex. 74 mph @ 5500 rpm (gps). 95 115 Merc Fish Mark 320, Motorguide TM. 48 mph @ 4800 rpm (gps). 94 200 Mariner EFI 65 mph @ 5800 rpm (gps). 92 150 Merc Matrix 67, Motorguide 45#. 53 mph @ 5900 rpm (gps). what the max rpm is for this motor?" 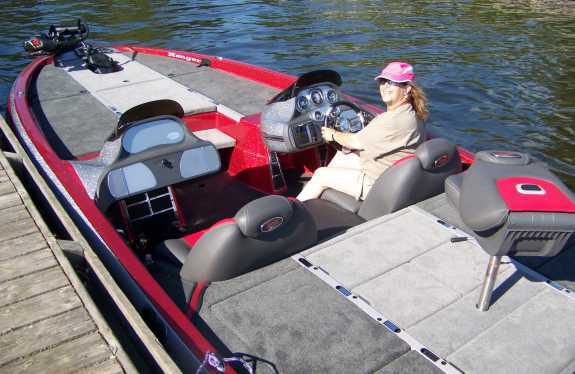 boat offers, and how to operate electronics, etc." 06 225 Merc Opti 80# TM. 88 150 Evinrude 57 mph @ 5600 rpm (gps). VMax 78 mph @ 6100 rpm (gps). "Boat still chinewalks at full trim!" 09 250XS Merc MinnKota Fortrex 101#. 74.1 mph @ 5750 rpm (gps). of fuel and all fishing equipment." 09 300 Merc MinnKota Fortrex. 71 mph @ 6100 rpm (gps). 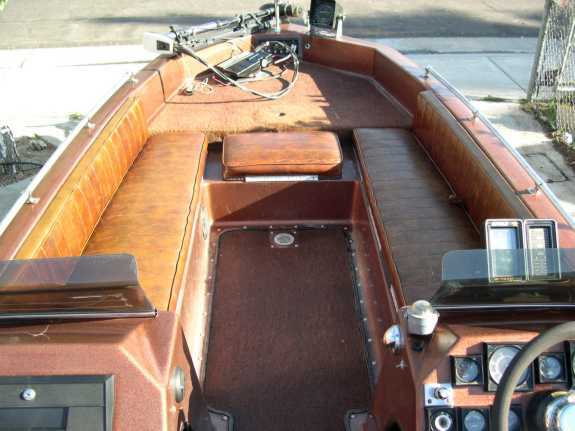 4 Stroke quality makes this boat my best boat ever." 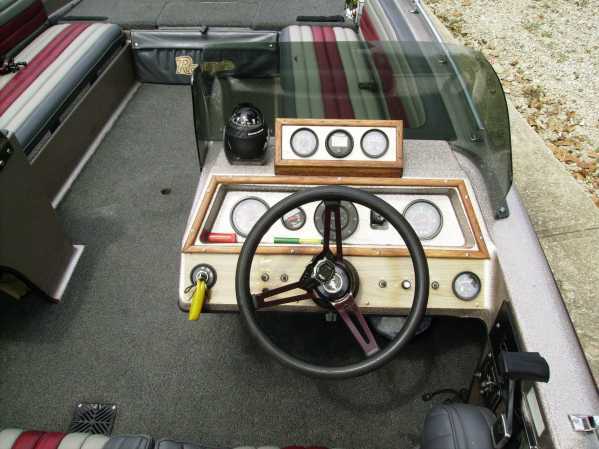 92 120 Evinrude 53 mph (speedo). 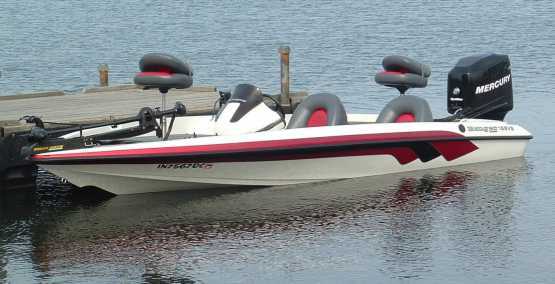 08 250HO Evinrude MinnKota 101# w/lift assist. 74 mph @ 6000 rpm. 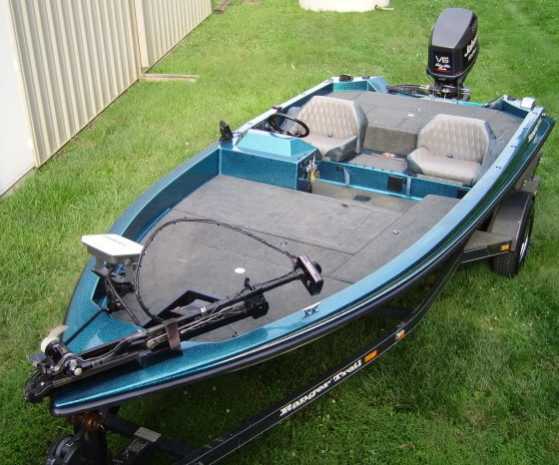 87 150 Yamaha MinnKota Fortrex 80#. 08 250 Merc Motorguide 82#. Motor is 1.5" above the transom. 73 mph @ 5500 rpm (gps). 61 mph @ 6100 rpm (gps). 178VS. I recommend it to everyone. Ranger Builds the Best! I don't think there is quite enough prop though. Going to experiment. Photos to come." 05 150 Yamaha Garmin 250, MinnKota 74#. 62 mph @ 5600 rpm (gps). and prop selection, picked up additional 6 mph." 87 175 Mariner 65 mph (speedo). 08 250 Merc Humminbird 323, MinnKota Fortrex. 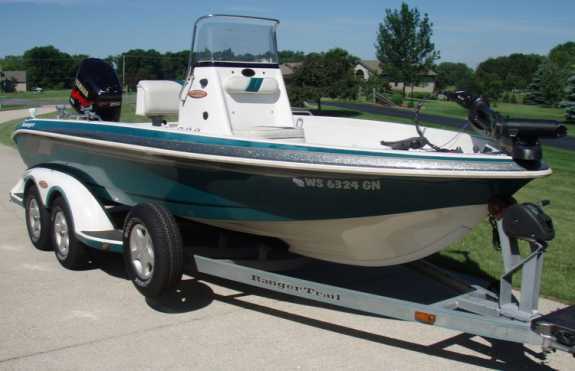 99 200 Merc Opti MinnKota Maxxum. Propshaft is 3.25" below the pad. 70-72 mph @ 5600 rpm (gps). 04 300 Yamaha 72 mph (gps). 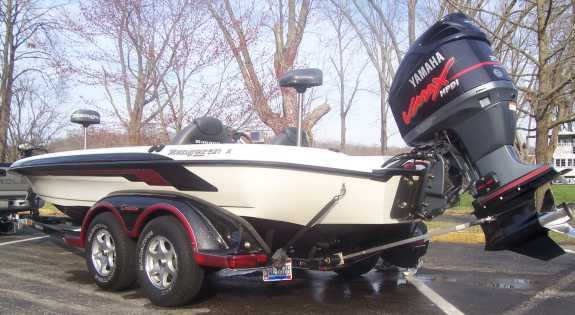 08 175 Yamaha MinnKota Max 80#. 63 mph (gps). 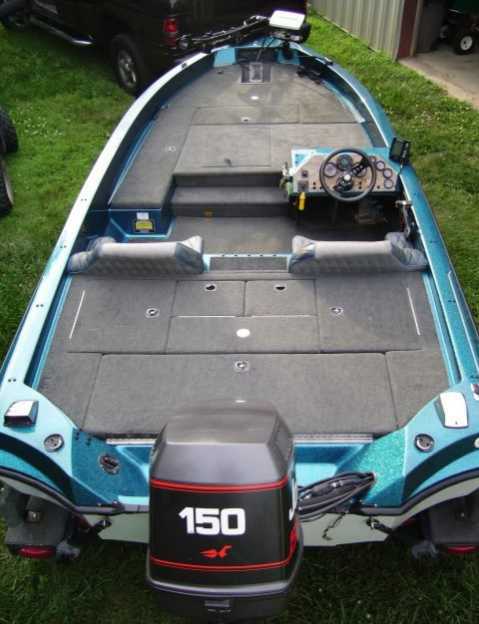 new TM, carpet, prop redone, Opti ProXS and a 10"
jackplate. 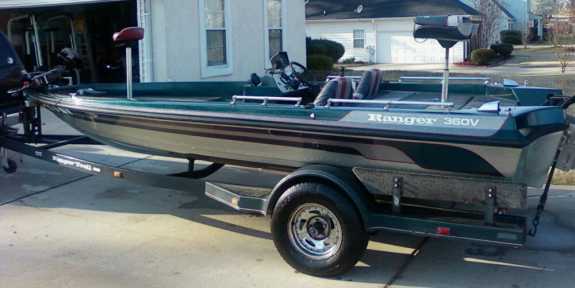 I love my baby Ranger!!" 00 225 Merc Opti Propshaft is 3" below the pad. 69.6 mph @ 5600 rpm (gps). 95 150 Merc Terrain TM. 91 150 Yamaha 56.9 mph (gps). 04 200 Evinrude HO MinnKota 101#. 65 mph @ 5300 rpm (gps). 85 90 Yamaha Propshaft is 3.5" below the pad. 08 225 Evinrude HO 75.3 mph @ 6000 rpm (gps). "Two year restore on this boat." 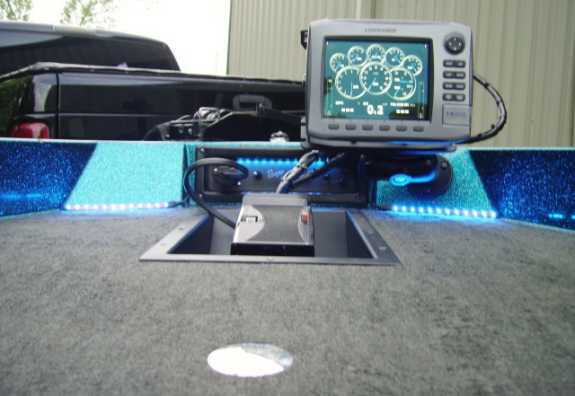 98 200 Merc EFI LMS 332C GPS, Humminbird 797si, MinnKota 80# TM. far so good, can't wait until next spring." Updated Feb 25/09...... correct setup after installing the Simon Motorsports Pro Max. 01 225 Merc Opti Propshaft is 3.5" below the pad. 71 mph @ 5700 rpm (gps). 08 150 Merc 53 mph @ 5140 rpm (gps). hit a home run here. They called it Skeeter eater. Great boat." 00 175 Merc Maxxum. 66 mph @ 5800 rpm (gps). 07 150 Merc Maxxum 70#. 63.5 mph @ 5500 rpm (gps). 92 175 Merc XRi Motorguide Brute 765. 63 mph @ 5800 rpm (gps). 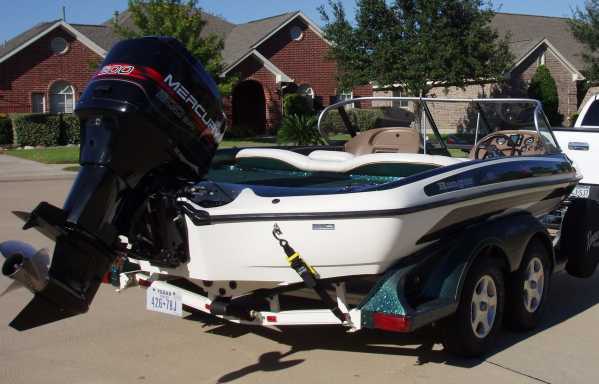 "Just bought the boat (Aug.08) and I love it! 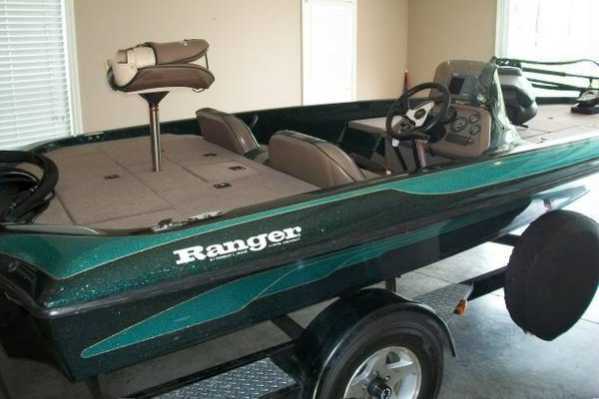 Also have a 25"
boat, first Ranger and I love it." 97 115 Johnson 48 mph @ 5600 rpm (gps). 03 225 Yamaha 70 mph (gps). from a 21" aluminum to a 24" stainless and gained 6 mph. lightning fast. Maybe 25/26" in future?" 08 250 Merc ProXS MinnKota 101# Pro Maxxum. "Amazing best Ranger yet. 84 150 Merc Propshaft is 3.75" below the pad. 56 mph @ 5500 rpm (gps). 3 bank Pro SE charger. 91 200 Merc 72# TM. 65 mph @ 5500 rpm (gps). 00 150 Johnson Humminbird 717, MinnKota Maxxum 74# w/transducer. Ficht Propshaft is 3.5" below the pad. 61.7 mph (gps). 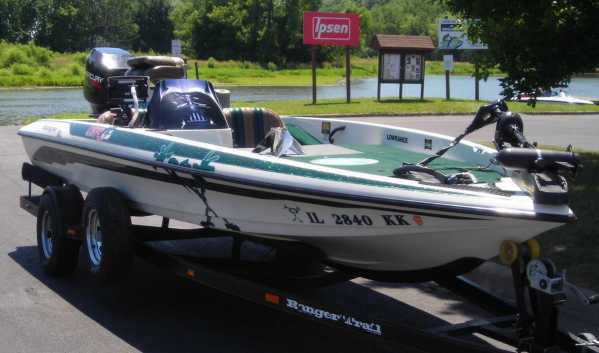 Updated 8/20/08..... "Full of gas, 14 rods and all tackle with 1 person on board. Need to start "tweaking" it...."
186VS MinnKota PowerDrive V2. 58 mph @ 6000 rpm (speedo). running but not looking to make her more efficient." carpet and seat $1000. Got to love Forrest!" 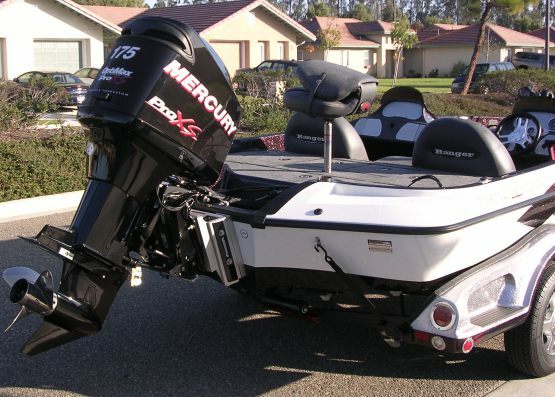 97 150 Merc EFI Fishfinder 320, Motorguide wireless 55#. Motor is 2.5" above the transom. 60 mph @ 5600 rpm (gps). 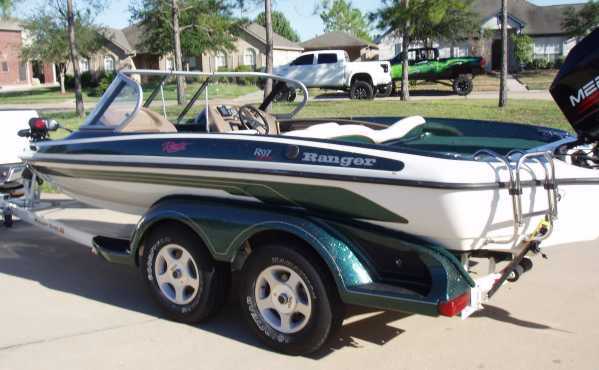 "I got my Ranger April 2007, my first one and I love it!!" love it. Rides and drives great, but I would like more speed. I know I need another prop but not sure what prop to try. rpms but with the Laser II it will turn 6000 rpms if I let it." 82 150 Merc "It's new to me!!" 03 200 Evinrude HO Motorguide Digital 82#. 75 mph @ 6000 rpm (gps). 94 150 Merc 60 mph @ 5700 rpm (gps). Ranger still looking good and running strong!" starts to get at speed but only time will help that." 00 65 Merc Jet run in less than 6" of water." HPDI 71.9 mph @ 5700 rpm (gps). 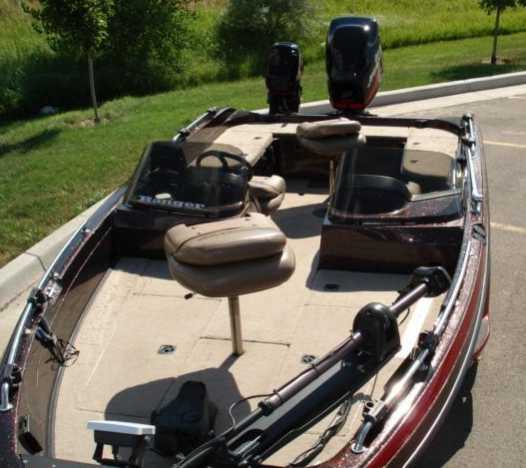 07 115 Evinrude Maxxum 55#. Propshaft is 3" below the pad. 57 mph. (90" beam). It's also the sturdiest boat I've ever been in. 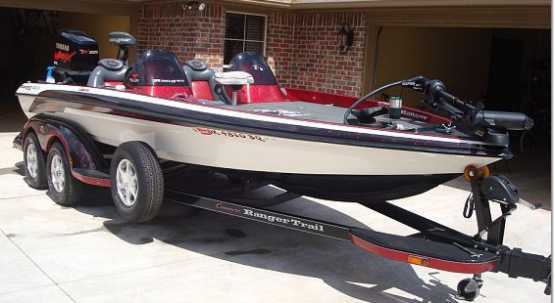 This thing is a fishing machine!!" 01 250 Merc MinnKota Maxxum 101#. 70 mph @ 5600 rpm (gps). 07 250 Merc ProXS Motorguide TM. Propshaft is 1" below the pad. best on average and boat will run 74-76 gps normally. Fastest was this past week at 76.3 gps. Half tank of fuel. 06 250 Yamaha 322C bow, MinnKota Terrova 101# US2. props for B&B on the prop, gained 4 mph full load." 88 150 Johnson Motorguide Brute 78. 52 mph @ 5000 rpm (gps). 00 225 Merc Opti 320DF, Motorguide Brute 76#. Propshaft is 3.5" below pad. 70 mph (gps) "Had both tanks full and fully loaded w/gear. Comanche MinnKota Maxxum 72#. 60 mph @ 5600 rpm (gps). 05 225 Merc MinnKota 101#. Propshaft is 2" below the pad. 72 mph @ 5600 rpm (gps). 96 150 Merc EFI Eagle 480, 320, MinnKota 74# Maxxum. 62 mph @ 5300 rpm (gps). motor I will be very pleased. Motor mods are coming soon. I won't own nothing but a Ranger from here on out!" the pad. 64 mph (gps). 07 225 Yamaha 767, 727, MinnKota Maxxum Pro 80#. Propshaft is 2 1/4"
below the pad. 72 mph @ 5600 rpm (gps). 03 225HO Evinrude Motorguide Pinpoint 109D. 67 mph @ 6000 rpm (gps). "This motor is amazing for a 225HO. I love this rig!!" 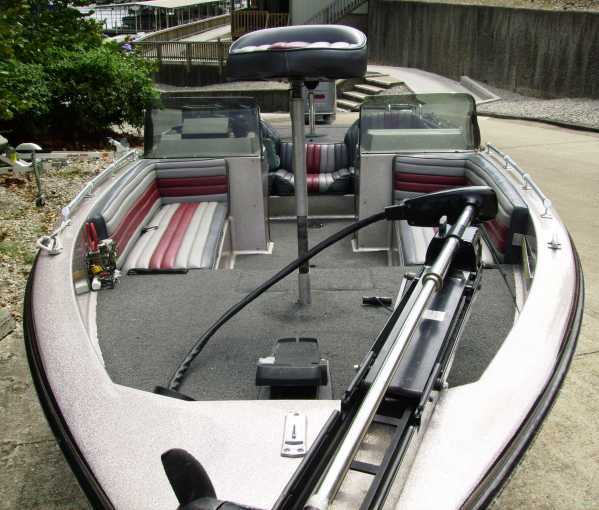 06 200 Evinrude 70 mph (gps). 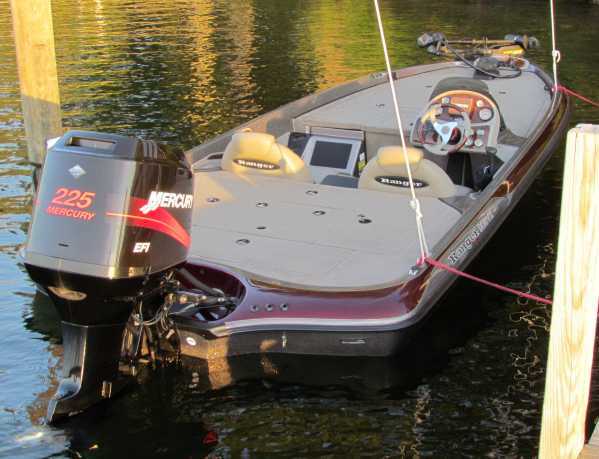 but for best possible performance, go with the 175 hp motor." 07 150 Evinrude HO MinnKota Maxx 80#. Propshaft is 4" below pad. 61 mph @ 5500 rpm (gps). go wrong with a Ranger." 07 225 Yamaha MinnKota 101# 36V. 70 mph @ 5800 rpm (gps). know top speed yet but it's really strong." 03 250 Merc XS MinnKota Maxxum 101#. 72 mph @ 5600 rpm (gps). 08 250 Merc ProXS Motorguide Digital Tour 82#. 75 mph @ 5830 rpm (gps). "Trying to determine best prop set-up for this new hull/motor." 04 225 Yamaha MinnKota 101#. 72 mph (gps). 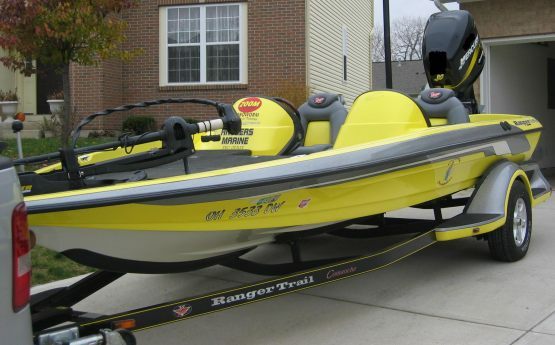 Copyright © 2000-2018 BassBoat Central Inc. All rights reserved.